Nothing awakens our feelings of independence quite like a private island. Perhaps that’s why so many people contact us with dreams of creating their own countries on them. Yet there’s much more to starting a micro-nation than simply buying an island and putting a flag on it. But what if that wasn’t the case..? 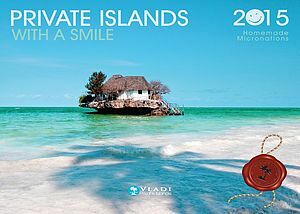 Vladi Private Islands, the self-proclaimed kings of the island world has decided to suspend reality in order to create 'Private Islands with a Smile' - the inimitable guide to home-made island nations. Start your own island nation with Vladi Private Islands.